Conversion Retainer cap is the entry level conversion cap, providing the advantage of Click&Dry™ exclusive standard features including pressure integrity, easy clean cap and longer wear part life. No welding required when upgrading from the older lance adaptor. 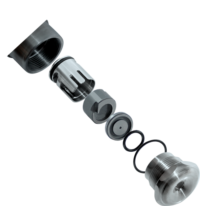 Benefit the Click&Dry™ Conversion CCT clasp system with total wear part alignment, improved pressure integrity, easy clean cap and longer wear part life. No welding required when upgrading from the older lance adaptor. Take advantage of the benefits using Easy-Out CCT Clasp, with perfect wear part alignment, easy removal access and wear part guarantee without the need for welding. 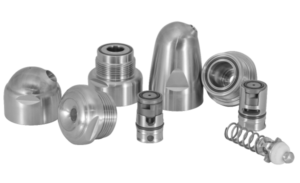 The optional Drip-Pro™ check valve reduces dripping and scorched particle problems. Simply screw the conversion adaptor onto the existing lance to benefit from the Click&Dry™ advantage and basic guarantee cover. Convert to Compact series and take advantage of all the benefits of the Click&Dry™ systems with superior guarantee cover. CCT clasp (non easy-out) – Concentric Clasp Technology – perfect wear part alignment ensures consistent spray quality and improve wear part life. Easy-out CCT clasp assembly – Easy-Out CCT clasp designed for no breakage removal of wear parts. Use with Click&Dry™ removal tools to improve wear part life. Refer to guarantee page. No welding (use older lance adaptor) – Easy upgrade with no welding required. Smooth cap chamber – Easy clean and high strength. Galling resistant threads – Assists in reducing thread damage. 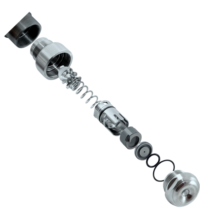 Large anti-galling threads – Prevent thread galling and lance damage. Easy clean. Heavy duty check valve reduces the problem of dripping and scorched particles. Add Drip-Pro™ check valve to receive all benefits from Compact push fit retainer/CCT clasp plus reduced scorched particle reduction for longer run times. Looking For The Ultimate Spray Dry Nozzle Solution? If your existing lances and threaded hardware are damaged then welding replacement is required. This is a great opportunity to upgrade, so why not move to the best Click&Dry™ options available. These include all of the cost saving, long life and performance benefits that are making Click&Dry™ the industry leader. 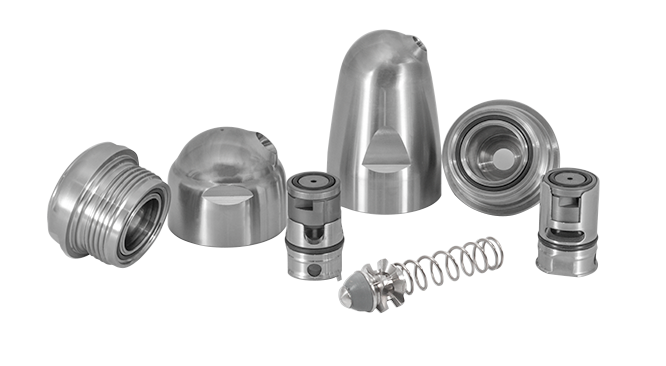 Click&Dry™ Compact Push Fit nozzles provide all of the pressure compliance benefits in a smaller & lighter package. Designed for compact inlet dryer types & long life with short lance dryers. This Entry Level provides all the basic pressure integrity benefits of the Compact series. 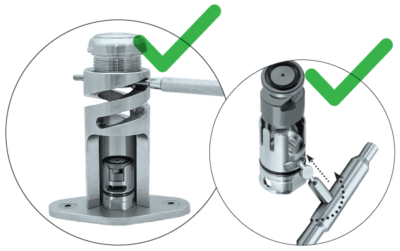 By upgrading to the compact easy-out CCT Clasp, you’ll also receive 2 years no thread galling, 2 years no wear part breakages, and 1 year wear cover on disc and swirl.